"Baked garlic is sweet and very yummy, as well as being very spreadable. Serve as an appetizer with a good crusty bread or with crackers. People can peel a piece of garlic off of the bulb and squeeze the soft, warm garlic our of its shell." Cut aluminum foil into 3 6-inch squares (large enough to wrap each garlic head). 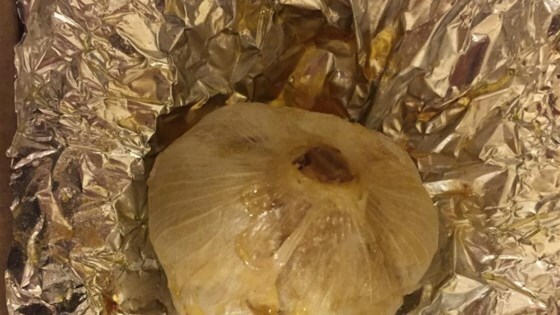 Place 2 teaspoons of butter in each square of foil and place one garlic head into each square of foil. Fold the packets up, and arrange them in a 9 inch pie pan. Bake for 30 minutes, or until the garlic is soft. you cant go wrong with baked garlic. i took the advice of others and used olive oil and salt. excellent. it is true, however, it takes about 40-45 minutes to get soft. I used olive oil instead of butter. Much more traditional and healthier. Excellent. Stick to the recipe, use butter. Olive oil can be a little overpowering, it tastes nicer with butter, and butter isn't as bad as it's made out to be.